We have found compelling evidence to re-assess the group of enamelled glass wares made at Yangzhou. We now believe they are not from the late Qianlong period, but part of a thriving snuff-culture antiquarian interested in Yangzhou in the second half of the nineteenth century that we will be addressing in Part II of the Water, Pine and Stone Retreat Collection to be published on the site next year. The article here deals with the evidence so that everyone has access to the same information at the same time. An Update on the William Bragge Illustrated Album. Click here to read the updated article. 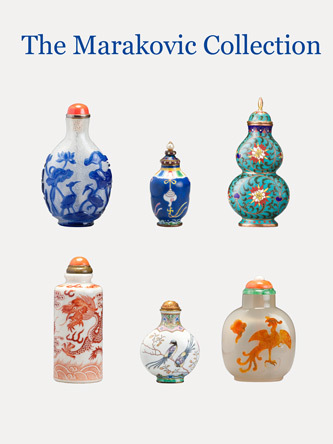 The article also has higher resolution pictures of all the snuff bottles featured in the book. Originally published: Still Point Arts Quarterly, Spring 2017, Issue No. 25. The member’s area is now open, you will need to register to gain access. There is no charge for this, just enter your details and let us know who you are. Please check your spam folder for confirmation emails if you don't receive them. Click here or use the link in the main menu to register or log in. 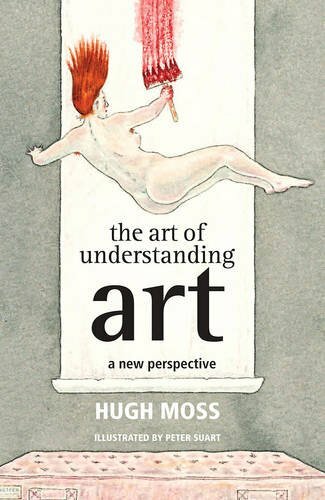 As Hugh Moss, author of the newly published book The Art of Understanding Art, says: “It seems we are suffering a serious art-theoretical lapse. We at e-yaji have decided to focus on the research and educational features of the site. We are astonished at the numbers of visitors we attract - at present hovering around 3,000 unique visits per week, a number which is greatly increased if we count repeat visits by the same person. For some inexplicable reason not all 3,000 of them are buying a snuff bottle -we won't get into how many unique buyers we get every week for fear of the onset of depression. Our public has spoken and we listen. We are, therefore, going to close down the sales portion of the site. It has, in any case, become somewhat inimical to our message as auction agents that the future of sales in the art world inevitably favours the auction format for anything where there is already existing, strong demand and an established market. 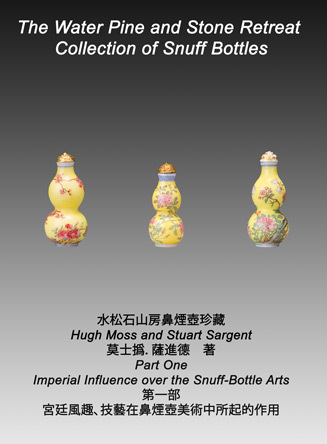 It is also a mild contradiction that Hugh Moss is now deeply involved in forming his own collection of snuff bottles, with all the potential conflicts of interest that might raise. Should circumstances change we shall re-consider our position. As a farewell, we thank you for your patronage and support and feel free to continue to contact us by email. The pioneering work by Henry C. Hitt has now been added to the resources section. It is a full digitised version of the book along with the later inside painted addition. 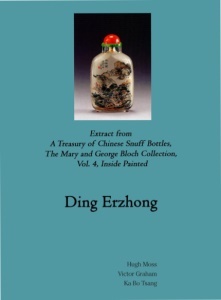 An Exhibition of known bottles by the inside painted artist, essays and the entire text and illustrations of the section on Ding from the recent seven-volume catalogue of the Bloch Collection, exactly as printed. If you haven't already then take a look at the resources section. As well as exhibtions the library section has a fully searchable copy of Reflected Glory in a Bottle with more to be added soon. We have big plans for e-yaji.com. We have received many comments that it is the best/easiest to use/visionary (oh, ok, no-one ever actually said that, but we read between the lines) website in the snuff-bottle world, so we have decided to improve it beyond recognition. From now on it will be abuzz with new ideas, new content, useful information, feedback options, and stuff that only Nick Moss understands. We will also include a complete list of all known songs about snuff bottles with free downloads. 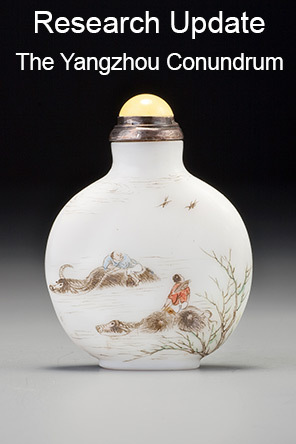 A new system for selling snuff bottles at auction. We believe that in a mature, rising market the best interests of the collector are served by selling on the open market through auction, and we offer a service acting on behalf of collectors to achieve the best results by working closely with major auction houses worldwide. Apart from the Bloch sales 1-5 working with Bonham’s, Hong Kong, we worked with Christie’s, Hong Kong and New York, on the J & J series of auctions (ongoing), and worked with Sotheby’s, Hong Kong, for Bloch sales, 6 – 10. We also worked on the Reif (October 18, 1993), Blanche B. Exstein (21 March 2002) and the Schonfeld (21 March 2013) collections at Christie’s, New York, and with the Robert and Molly Hsieh collection at Sotheby’s, New York (March 23, 2004). If you are interested in disposing of your collection in a cost-effective way, taking advantage of our snuff-bottle expertise, contact us and we’ll be happy to give you more details of the logistics, options, and costs. We will have a section for exhibitions, which, once up, will remain permanently. This will include education exhibitions curated by collectors or anyone else who is interested and by ourselves, including exhibitions of individual collections (although we reserve the right to edit or decline such exhibitions). One such exhibition which intrigues me at present is one of my ideal collection, if I had access to infinite funds and could select any known snuff bottle. 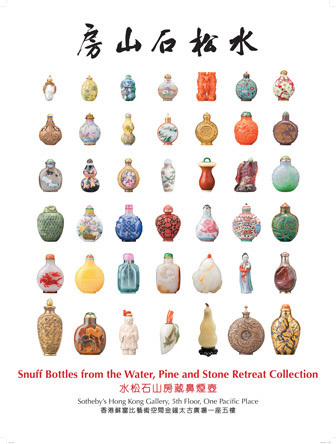 This may be conflated with an exhibition of the entire history of the snuff-bottle arts. Bear in mind that with the web, one can continually add to and edit content, making it a far more flexible medium than print. We will also provide a platform for collectors who want to publish their collections, or other related books on snuff bottles (written by themselves or others) but would rather not go to the expensive (and often tiresome) option of printing and distributing individual books. We will try to make much of this content inter-active to allow feedback, so that we can continually add to and improve the information available. Part of our plan is to gradually employ academics to help us with existing content and provide additional content (funded by the new auction set up, in theory), so hopefully we can make a good deal of the content bi-lingual and provide translation and research facilities to anyone who is interested. 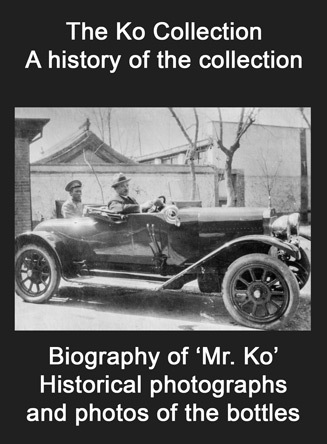 We envisage the possibility of undertaking for other dealers or collectors the cataloguing of exhibitions on a commercial basis. We will scan in old, difficult to find publications on snuff bottles so that they are accessible to all, and, eventually, perhaps even aspire to having all known works (of merit) on the subject included, but I shall be long-dead by then! A snuff-bottle bibliography will be posted, which we will add to as new books appear. We will also try to provide useful listings: dating systems with charts, lists of artists, research encyclopaedia, etc. We will also have links to other useful sites. One of the great advantages of the web is that it is always a work in progress, so we are not bound by the need to get everything right before we publish, as we would be in the world of print. We will constantly be open to new suggestions for improving the site, and will provide a feedback option for comments on the site, its construction, and uses. So, log on regularly – we will. 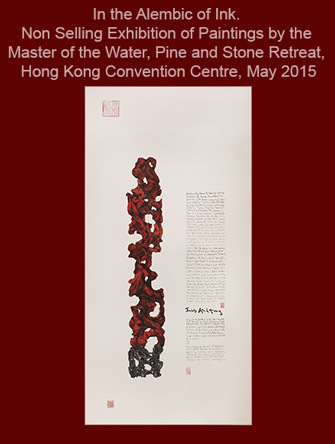 Hugh Moss, in the Water, Pine, and Stone Retreat.